Makeup And Fashion Freak: How well do you know your skin? Makeup being my forte I have to be really cautious when it comes to my skin care. Coz of my busy schedule and the present weather it got really difficult for me to deal with my skin. To get tips for healthier skin I started looking-up online for skin care suggestion and ended up landing on this BoroPlus page where we can check our skin score. So, to know how healthy my skin is I went through this app by BoroPlus “My Skin My City”.The app helps you to know how well your city is for your skin. It takes you through a series of questions wherein you have to answer them according to your skin type to get your skin score. 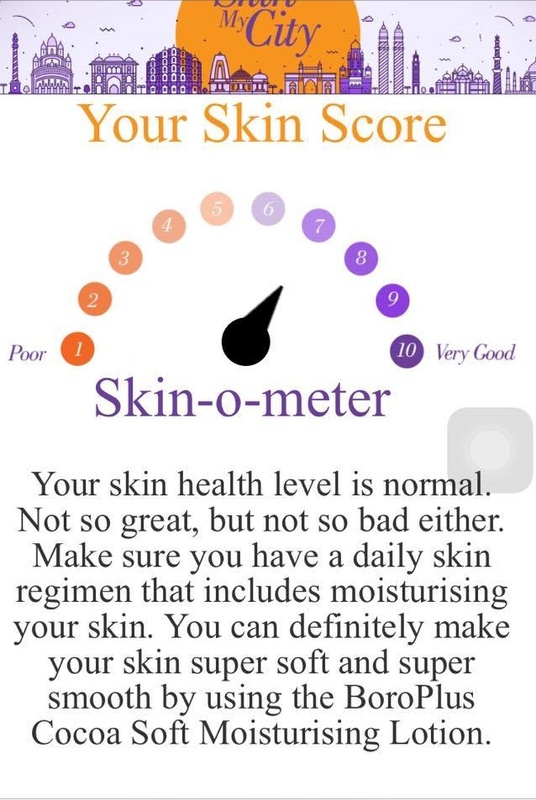 Once you answer all the question you get a skin score and feedback about your skin with a recommended tip for healthy skin. I got 7/10 which is pretty good if I consider the city and weather I stay. The app also recommended me for using the BoroPlus Cocoa Soft Moisturizing Lotion to help recover my skin. I am looking forward to use the BoroPlus Cocoa butter for a healthy skin and to get a perfect score of 10/10! !One more interesting fact about the app is it also shows you the skin score of your city and other major cities based on user scores from those cities. So, here is something that I have got for you all. Take this quiz here and know your skin, inside & out! #MySkinMyCity.